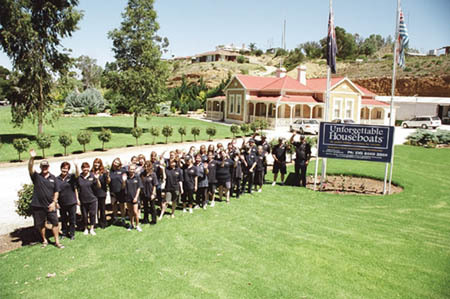 The Unforgettable Team will ensure that your holiday on the Murray River is enjoyable and a "Trip of a Lifetime." The Team at Unforgettable Houseboats pride themselves on customer service. This is one of the reasons we are Australia's most awarded houseboat hirer. We will do everything possible to make your South Australia River Murray cruising experience Unforgettable. The quality of our product is directly reflected by the quality of our team and their efforts. The Unforgettable turnaround system, is a credit to the team's effort and pride and will ensure your holiday on the Murray River is truly unforgettable. Our quality team is also why we are the most awarded house boat hire company in Australia. Mark and Lee-Anne manage the Unforgettable Fleet, they are very proud of the Unforgettable holiday experience and passionate about customer service. They are committed to improvement and continuing to develop a world class experience on Australia’s iconic Murray River. Chances are you'll meet Mark, Barry or David once you've arrived for your holiday. As your instructors, they will ensure that you're comfortable with your houseboat, understand its operation and after a short introductory lesson will send you on your way for the holiday of a lifetime. When you arrive for your houseboat holiday, Lee-Anne, Charlotte, or Jenny will ensure that you feel right at home onboard. They will complete the contract paperwork, before directing you to your houseboat ready for boarding. After settling onboard you will receive your driving lesson with one of our friendly instructors!